2,700 lives saved through our partner Healing Faith Uganda. On August 9, The D. Gary Young, Young Living Foundation Malaria Center operated by Healing Faith Uganda in the Mayuge District celebrated its one year anniversary! The Malaria Center is extremely valuable to the communities surrounding it, as life-saving treatment is provided to at-risk individuals living in the vicinity of Lake Victoria, Africa’s largest lake. Moreover, thanks to each and every generous donor, testing and treatment is free to all individuals who visit. Especially thankful for the services provided by the Malaria Center are four siblings: Christine (14), Masilina (11), Shadrack (6), and Peter (4). After their first visit to the center, the siblings were empowered through education, learning how to spot the signs of malaria and get tested as soon as they begin to reveal themselves so as to not let the disease worsen. 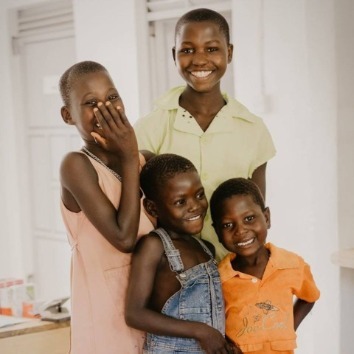 The siblings have paid a few visits to the Malaria Center in its first year of operation, but most recently, all four children tested positive for malaria. Thankfully, none of the children had severe malaria yet, and all were able to receive treatment to rid of the sickness. Additionally, after receiving their medicine, the Healing Faith Uganda staff gave Christine, Masilina, Shadrack, and Peter information on how they can stay healthy and prevent malaria in the future. Treating malaria is extremely inexpensive. To test and treat all four siblings suffering from malaria, the cost was a mere $4. $1 has the power to save a child’s life, and $2 will provide testing and treatment for an adult. Treating malaria is extremely inexpensive. To test and treat all four siblings suffering from malaria, the cost was a mere $4. $1 has the power to save a child’s life, and $2 will provide testing and treatment for an adult. This means that your spare change has the power to save a life. Every time you round up your Young Living order, or make a direct donation, you are contributing to a person’s well being. You are empowering others with every penny and dollar you donate!